The best Japanese cherry blossom. 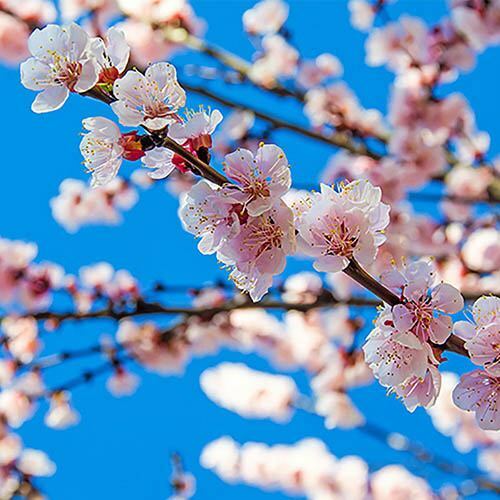 A variety of Japanese Fuji Cherry featured in their national Cherry Blossom festivals. This small, compact tree is smothered in purest white, dainty flowers every spring. And you get fabulous autumn orange and yellow colours in the leaves, before they fall for winter. Will grow to approx. 4m (13ft) in 10 years. Fully winter hardy. Perfect in lawns as specimen trees. Supplied as a bare root tree for autumn planting. (Dormant in winter, so no leaves). This small flowering Cherry tree is a real show-off in spring, its purest white displays lasting for days and days. A variety of the famed Japanese Fuji cherries, so famous in their spring cherry blossom festivals. You can now recreate that amazing spectacle in your garden every spring, plus in autumn, you get gorgeous orange and yellow colour tones as a last hurrah, before the leaves fall. A perfect small tree as a specimen or lawn planting, reaching only 3-4m in 10-15 years, and a nice rounded shape, so easy to manage too, a real garden winner! Supplied bare root. Will grow to approx. 4m (13ft) in 10 years. Fully winter hardy. Best planted in autumn, from October to November. Choose a sheltered location (to protect the blossom when it emerges in the spring). Spread the roots if possible from the soil bundle and place into the planting hole. Mix well-rotted compost or manure with the soil taken from the hole and then use to backfill around the tree.